After 7 weeks of sitting home recuperating after surgery, I was ready for adventure. 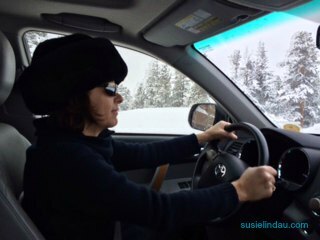 My husband, Danny, went skiing with work buddies, so I decided to drive up Friday night and meet him in the mountains. We have a home on Baldy Mountain just above the town of Breckenridge opposite the ski resort. I just about gave up packing my car since I was so exhausted, but forced myself to keep going. I HAD TO GET OUT OF THE HOUSE! 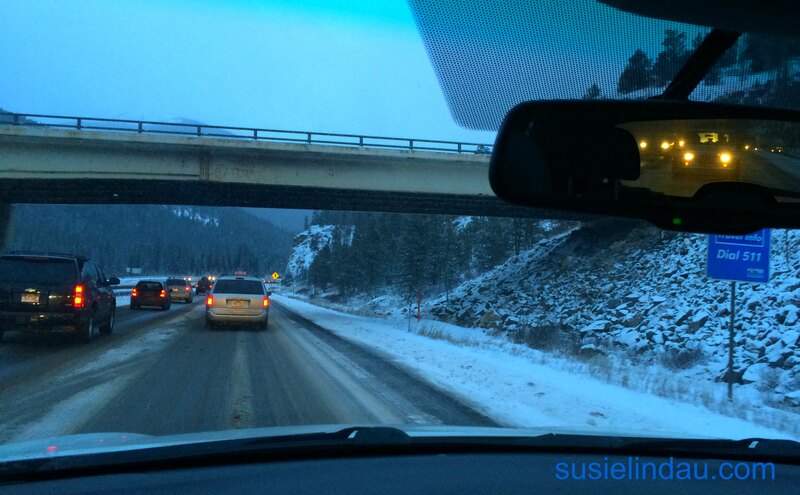 On my way up, I hit a snowstorm, but love driving in snowy conditions even though it added an hour to my drive. I’m a Wild Driver. As promised by my surgeon, I woke up Saturday morning with unbelievable energy after a steroid shot the Monday before. I decided to make a breakFEAST. While running to the grocery store, I pulled over next to a gnarly snowboarder dude with some pretty cool dreads waiting at the bus stop. He told me he spends half his time in Breck and the other half in Maui. I dropped him in town at Starbucks where he worked and would meet his friends. “Next time you come to Starbucks, coffee’s on me!” he said and hopped out. “Ski a run for me!” I shouted. I bought groceries and went home to make said feast. My daughter and her friend drove my husband, Danny, to the mountain to ski and I found myself stuck inside once again. I got a call thirty minutes later. For the first time ever, they couldn’t find parking. All the lots were full. It was dumping bucket-loads of snow and everyone wanted to get on the mountain. There was a huge line at the Gondola in town too. They returned home so I could drive them. “Giving him a ride. We have room.” I rolled down my window. “Hey! We’re headed to Peak 7. Want a ride?” The snowboarder was very grateful. We picked up his friend hiking down the road and then headed to the resort. After I dropped them off, I drove back home and noticed the bus stops were still full. My guess was everyone and their grandmother wanted to go skiing since we had a pretty long dry spell and the flakes were flying. I formulated a theory. I bet the busses are filling up before making it to the top of Baldy. When I noticed three snowboarders waiting at that lower stop, I had a Eureka moment. I dropped them off at Peak 8 and told them, “Take a run for me.” They gave me a thumbs up and high-tailed it to the lift. She worked on Main Street and was going to be late. She was from Arkansas and had graduated from the University of Northern Colorado. “I decided to spend one winter in the mountains before getting a real job,” she said I dropped her off at Bubba Gump’s. The couple piped up first. “Sure! You can drop us in town.” The older ladies who held skis glanced at each other and didn’t move. They followed the couple, threw their skis in the back of my car, and jumped inside. The couple was from Denver. They were late in meeting their son at the Marriott where he worked. The hotel was my first stop. The Ladies were from Nashville. “We always bring the snow with us,” they said and giggled. We’d love a ride to Peak 8, if it’s not too much trouble. “No trouble at all,” I said. As I passed three skiers at the bus stop less than a mile away from the resort, I shook my head. They would be better off walking. “Just ski a run for me,” I said like I had told everyone else that day. “Why are you doing this?” one of the guys asked. “I had knee surgery seven weeks ago. I can’t ski, but I thought I’d help you out.” I pulled into the drop-off. “You should drive with Uber and make some money.” he said. They were amused and really thankful like everyone else. They hopped out of the car and promised they would keep me in mind while taking their first run. By the time I got home, the busses had caught up. My work was done for the day. Have you ever picked up random strangers? Would you like to be a cab driver for a day? Related post: The time I hitchhiked a ride on a plane. Oh, and that picture of you made me shout ARE WE NOT MEN?!!!!? Great gesture! Yeah, I guess it’s all to do with the place and the people. We get few deliberate hitchhikers here in NZ, compared with earlier days – too many incidents. That’s how it is everywhere else. I don’t see many hitchhike anymore. The people I picked up were all at bus stops. There’s a free line that takes everyone to town and the mountain. It would be a haul and dangerous to walk to town on snowy roads in a storm. It was fun to help out! You far and beyond exceeded the random acts of kindness. Awesome thing you did! I’m still smiling. I am just thrilled imagining all the karma points you amassed in your day of non-Uber shuttling, Susie. You rocked it. Perfect. And think of how good life will be in town if everybody pays it forward. 🙂 Yay, you. Thanks Mark! I hope so too! The people I shuttled were pretty stoked. Wouldn’t it be great if I could cash it in on my knee? I have seen some improvement, but skiing is still off in the distance. Speedy recovery, my friend. This shuttle day should help your spirit, which help the body mend faster! I hope!! I’ve only picked up a stranger once and he was on crutches, so I figured the risk was low. LOL! Thanks do much, Jackie! I think you made a good assessment! Ha! I hope I started their day off right, anyway. I picked up two ladies on the way to drop off my husband last Sunday and have another story to tell. Life is freakin’ amazing! That’s hideous! You’re the best. To answer your question, yes I have picked up a random stranger, but it was mostly because his car was in the ditch and he had a puppy in the car. I’m a sucker for puppies. My husband was with me and he’s a big scary dude, so I felt relatively safe asking the kid if we could give him a ride somewhere. He was really grateful, especially since his dog was freaking out about the accident. We almost couldn’t coax him into the truck. Poor little guy. So that’s my story. I’m glad you were able to get out and do some good while you were at it. Awww! Cute puppy hitchhiker stories are the BEST! I’m glad you helped him out. I was going stir crazy and had to do something. It was fun and I met a lot of people.